Parrotfish have large scales that are easily removed for cooking. 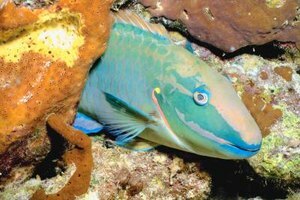 Parrotfish, named for their strong resemblance to their avian counterpart, appear in an array of brilliant colors, ranging from coral reds to vivacious violets to bright turquoise. You can purchase these tropical reef-dwelling fish year-round; they are usually sold gutted whole and frozen. Cook parrotfish with strong, exotic flavors like chili, ginger, garlic and lemongrass or stuff it with bold herbs. You can bake it whole or fillet it for pan-frying to serve with a hardy sauce. Prepare a parrotfish by cutting it into fillets for pan frying. Scale the fish and cut the fillets away from the backbone. Rinse the fillets with cold water and pat it dry with paper towels. Apply seasonings such as salt and pepper. Heat a small amount of oil in a non-stick skillet over high heat. When the oil is hot, add the fillets, season-side down. Cook on high until the edges begin to brown, approximately 4 minutes. Reduce the heat and cook them until they're golden-brown, approximately 3 more minutes. Season the skin side and flip over, increasing the heat to high once again. Add the desired amount of butter and lemon juice. Tilt the pan until the butter mixture forms a small puddle, keeping the fillets on the "dry" side of the pan. Using a spoon, repeatedly ladle the lemon-butter mixture over the fillets until they turn a dark golden-brown. Remove the fillets from pan. Create a sauce using the remaining lemon-butter mixture by adding ingredients like heavy cream and fresh herbs. Descale the fish and rinse inside and out with cold water. Pat them try using paper towels. Squeeze fresh lemon juice inside the fish cavity and rub lemon wedges on the exterior skin. Briefly saute leeks in a non-stick skillet with a small amount of olive oil for approximately 4 minutes on low heat. Add garlic and seasonings and saute an additional minute. Remove them from heat. Add half of the sauteed mixture to the inside cavity of the fish and coat the exterior -- both top and bottom -- with the other half. Bake whole parrotfish in a medium-hot oven, or approximately 350 degrees Fahrenheit, until flaky and opaque, or around 30 minutes. Determine the thickness of your fish before cooking and cook it for 8 to 10 minutes per inch or 4 to 5 minutes per half-inch. Cooked fish are opaque in appearance. Insert an instant-read thermometer into the thickest part of the fish; when the thermometer reads 145 F, it's done. 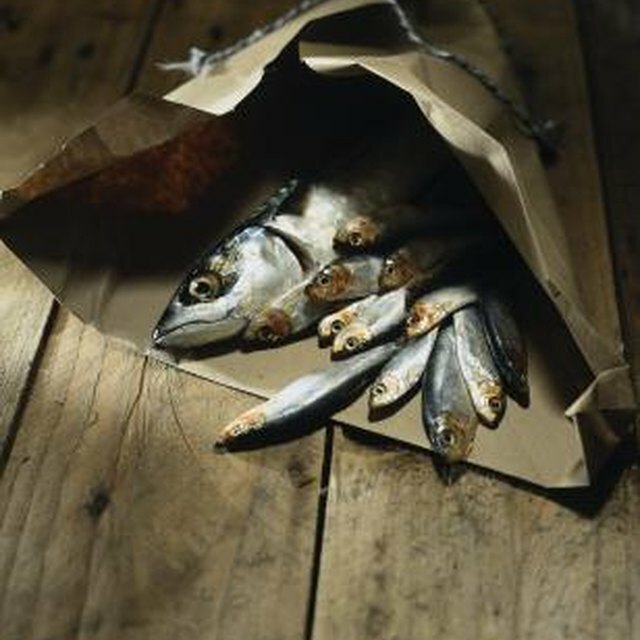 Undercooking fish increases the likelihood of exposure to foodborne illness.